It looks Like Ooma is not so cheap anymore,as we thought before. Guys if you would not like to pay any RRF you can switch to MagicJack Plus, which was released September 22,2011. You can use it without Computer and it will cost you less then Ooma with RRF: http://www.ooma.com/forums/viewtopic.php?f=6&t=12293&p=86864&hilit=Regulatory#p86864. Tested with Verizon DSL (768K for 19.99) works perfect! No PC required anymore! [u] ___________"Ooma"___________"MagicJack+"_______"MJ+ with 5Year agr." There’s really not much to the device. You may not even need the smaller of the two cables. 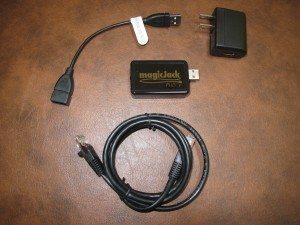 It’s a USB extension cable and you may be able plug the magicJack into your computer without it. I decided to see how idiot proof the installation was, so I plugged the device into my LAN, via a powerline Ethernet adapter, hooked up the phone and within 30 seconds had a dial-tone. There’s no computer involved in the configuration, but to keep the device active, you’ll have to register the magicJack online within 48 hours of installing it. To minimize the number of variables when testing this thing, I used a corded phone, so the sound quality wouldn’t be affected by cordless phone issues. Here’s a closer look at the setup. 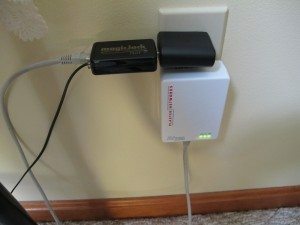 The magicJack plugs into the AC adapter, which plugs into the AC outlet. On the left of the unit you have a socket for the phone cable and one for the LAN cable. You could of course run the LAN cable from your router or switch. 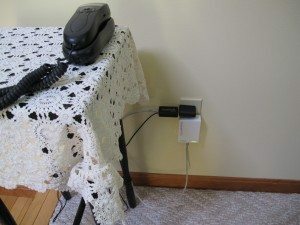 I like using powerline Ethernet because I can locate the phone anywhere there’s an AC outlet. Last edited by garg11 on Wed Oct 12, 2011 5:56 am, edited 2 times in total. $5.39 per month is not accurate if you took that from my post; again, $5.39 is tax on my cell phone bill. Not Ooma. Ok, 3.47 per month it will cost $41.64 per year, compare to MagicJack plus is $29.95 yearly or $20 with 5 years bunch. Starting price for Ooma is $200 and for MJ+ is $70. Anyway MagicJack+ became better then Ooma.I'm sorry, but RRF killed Ooma. You Don't have to be a patriot of Ooma you can have better. For example: you don't have to drive car 1998, if you can drive newer, it is natural. I just bought Ooma at Costco and did not know MagicJack Plus is now available. 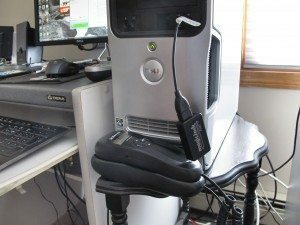 I tested the original MagicJack which needed a computer to work and the voice quality was not that good. Since I am still in my evaluation period for Ooma, I am REALLY interested to know what others have to say with respect to voice quality of MagicJack Plus vs Ooma. The porting of my land line from $39.99 vs $19.99 and the intial upfront costs sure are attractive for MajicJack Plus. I should also add that a few years ago I bought the Nettalk VoIP device and it was a nightmare with echos and the voice quality with Nettalk was horrible, just horrible. The voice quality with my new Ooma Telo using the same home network provider has been excellent however. So my Ooma Telo is much better than Nettalk for voice quality. I should give MajicJack Plus a try while I am on my 90 day Ooma evaluation, but I like to hear from others here who have used both the Ooma and MajicJack Plus with respect to overall voice quality. IMHO, MagicJack is not worth it. Device is low quality and until they came out with MJ+ you had to have a computer powered up just to make a phone call. Ooma may not be as cheap but you get what you pay for. For me it's the overwhelming feature set that gets me. I did a search for "Call Rejection" and "Anonymous" in their knowledge base and nothing came up. That alone is reason enough to not buy MagicJack. You totally get what you pay for. Oh... and while you should read all EULA's, read the MagicJack EULA very very carefully. Wilsonium wrote: IMHO, MagicJack is not worth it. Device is low quality and until they came out with MJ+ you had to have a computer powered up just to make a phone call. Ooma may not be as cheap but you get what you pay for. For me it's the overwhelming feature set that gets me. I did a search for "Call Rejection" and "Anonymous" in their knowledge base and nothing came up. That alone is reason enough to not buy MagicJack. You totally get what you pay for. Yes the Call Rejection option in Ooma is fantastic, but this is the $9.99 Ooma extra per month, correct? $120 per year. For $70 bucks (one time purchase) I bought the TeleBouncer TB1000 and it has eliminated 99% of Telemarketers. We went from getting 80+ automated telemarketers calls a week to basically zero per month. We have had our same number for 30+ years. As for you get what you pay for, that is the crux of the question. So far, my Ooma Tele voice quality is great. The question is now open for how MajicJack Plus compares to Ooma with respect to Voice Quality. Obvioulsy, MajicJack Plus is cheaper than Ooma. joe123 wrote: So far, my Ooma Tele voice quality is great. The question is now open for how MajicJack Plus compares to Ooma with respect to Voice Quality. Obvioulsy, MajicJack Plus is cheaper than Ooma. Until the black dot disappears, no brainer. Good quality or poor quality. Hmmmmm..... Just because it is new, doesn't mean you can expect something that hasn't been. Thanks for posting that chart. Is that from Consumers Report?